Size: 25.8 x 38.4 inches. ONLY RECORDED COPY Rare separately issued broadside map, published in London by George Thompson and dated Jan. 1st, 1808. A two-sheet (655x975mm.) double-hemisphere map of the world surrounded by insets of polar and other projections, celestial spheres in the cusps and other astronomical diagrams. Including the wonderful, figural, title cartouche featuring natives, the map has a total of twenty-six separate sections. Shows voyages of Captain Cook and crews, and discovery of Cape of Good Hope by Vasques di Gana in 1487. Relief is shown by hachures. Original colour is outline in the hemispheres with fuller colour in the title cartouche. In the late 1600’s to the early 1800’s, British publishers produced a sequence of large double-hemisphere world maps each printed on two sheets and conjoined. This allowed the large 3’ x 2’ size using hand made paper. 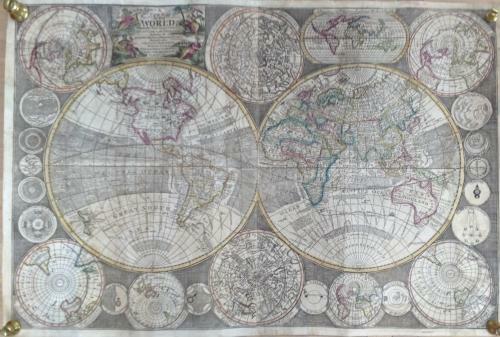 The map is only recorded in a handful number with the date of 1798. This state is featured in ARMITAGE: “The World at Their Fingertips”, Map 23 and one copy listed at David Rumsey's site. Our example is dated Jan. 1st, 1808 and is an unknown variant. George Thompson (1758-1826) was a very successful London publisher, despite most of his output being derivative, he died leaving a sizable estate. Unfortunately the map was discovered with some missing areas. With loss of image in the bottom right and top left corners. Missing paper reinstalled and missing parts redrawn. Condition: Good impression on heavy hand-made paper. With loss of image in the bottom right and top left corners. Missing paper reinstalled and missing parts redrawn.The map has been reinforced with an application of Japan paper to the full verso. Not perfect but nevertheless a very desirable map.